Disclaimer: I am not an expert on comic books. I am just a person, who thinks comic books are fascinating, and want to get into them more, ergo this review. 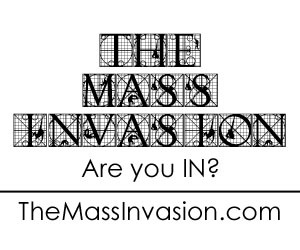 So please forgive me if I don’t know specific writers, colorists, or artists yet. I’m still getting know these universes. Much thanks. I picked up this graphic novel after hearing the podcast “The Women of Marvel” gush about it and since I wanted a way into discovering more about the comic book universes, decided Ms. Marvel would be the way to go. Miss Marvel: No Normal is a collection of the Ms. Marvel comics (2014) issues #1-5. 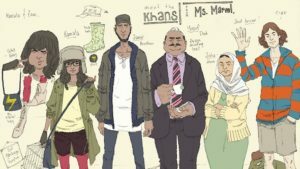 A short synapses: This story follows a high schooler by the name of Kamala Khan, who is trying to navigate her way through her life in Jersey City, between her over protective immigrant family, school, and puberty. It is during this time, while she’s out at a party she was forbidden to attend, she gets caught in the middle of a terrigen cloud and obtains powers. Although she doesn’t have the same abilities as Carol Danvers (the original Ms. Marvel), she does takes on Ms. Marvel’s name, and for a short while, her image as well, in honor of her hero. This volume walks us through how she discovered how her powers work, learning what it takes to be a hero, finding her own identity within the Ms. Marvel mantle, and the first glimmers of her team, all while attempting to hide her new found abilities from her family and most of her friends. 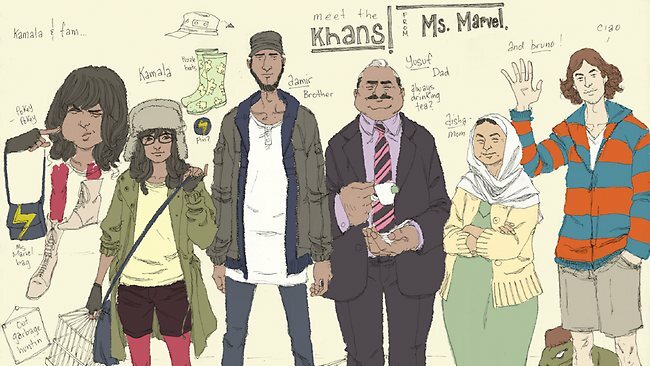 Writer G. Willow Wilson is really clear on the voices of her characters, from Kamala, and her family, to her friend Bruno, to the school socialites. 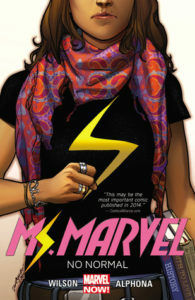 Kamala is funny, witty, geeky, and not overtly insufferable, as many teens are generally portrayed. I found myself hearing the different personalities of each character as I read them, which made it a joy to read. Adrian Alphona’s artwork, offers an offbeat appeal to the story, which blends well with Kamala’s narrative, and Ian Herring’s coloring, in muted tones, gave it a great youthful feeling. 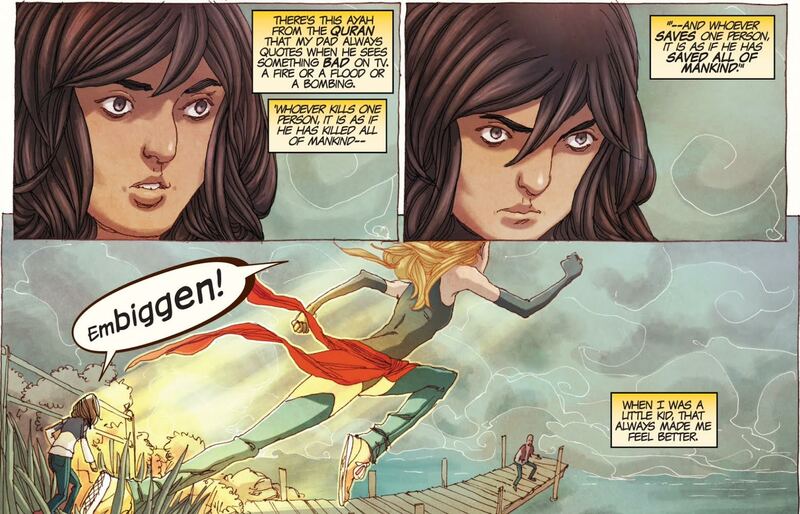 The Long and Short of it: Miss Marvel: No Normal, is an easy read and made me want to pick up the next issue. The story line was relatable and the character development engaging. You find yourself feeling for Kamala when she’s dealing with her parent’s over protective nature as well as her frustrations when dealing with The Inventor. You can pick up this issue on Amazon Kindle, or your local comic book shop, or your local large book seller. ← WTF is with Batman & Batgirl in Batman: The Killing Joke?